Last night we attended opening night of the 13th season of Prelude to Performance, Martina Arroyo's summer program in which 75 participants study for 6 weeks learning roles. They are given instruction in language, dramatic interpretation, recitativi, and stage combat; they receive coaching and also participate in several master classes, some of which we have reviewed. This program is unique in that the young artists receive stipends, thanks to the generosity of the donors who support the program. Many graduates go on to major careers. Judging by the tumultuous applause that greeted the curtain call of Bizet's Carmen, the program is, as it has been, a major success. Participants learn a great deal and walk away with a role "under their belts" that should serve them well in the future. And the audience, comprising a Who's Who of Planet Opera, walks away happily entertained. If you share our taste, it's likely that you have longed for a traditional production of Carmen. We have gotten rather tired of updatings and novel interpretations, with the exception of one very radical Carmen produced by Heartbeat Opera. One can always count on Prelude to Performance to do a traditional production and to do it exceptionally well. Last night's Carmen can be seen again Saturday night and we hope you will still be able to secure tickets. 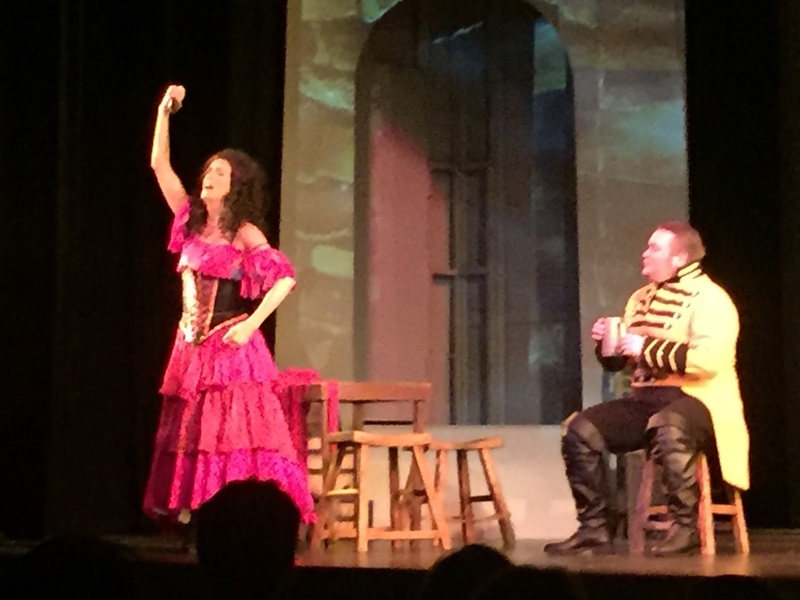 You will see the beautiful mezzo-soprano Emily Grace Righter as Carmen and tenor Ben Werley as Don Jose. This tragic character must evolve from a rather buttoned up corporal as the opera commences into a raging murderous maniac at its conclusion. Mr. Werley's plangent tenor was most remarkable in his second act aria "La fleur que tu m'avais jetee"; he was totally convincing as the lovesick corporal and evinced a lovely legato. We recall Ms. Righter from four years ago when we reviewed her performance in a small role in Rossini's Mose in Egitto, presented by New York City Opera. She is maturing into a fine performer with a very lovely instrument and fine stage presence. As she grows into this role, we hope she will dig deeper into the earthiness, a difficult task given her refined appearance. There was nothing wrong with her seductive acting but we feel that there is a need for a deeper more organic approach. Baritone Brian Major has a fine instrument well suited to the role of Escamillo but also needs a bit more work in creating the character from the inside out. Soprano Sarah Cooper performed the role of Micaela and grew in stature such that her third act aria "Je dis que rien ne m'epouvante" brought down the house. We greatly enjoyed the performances of soprano Shana Grossman (Frasquita) and mezzo Olivia Johnson (Mercedes) who threw themselves into their roles with abandon. As a matter of fact, our favorite part of the opera was the second act quintet which provides some necessary comic relief. Baritone Dan Ewart as Le Dancaire and tenor Hector Mir as Le Remendado turned in some fine performances as they joined the three women in the humorous planning of a smuggling operation. Bass Zaikuan Song handled the role of Zuniga, Don Jose's superior and competitor. Phillip Bullock used his mellow low voice in the role of Morales, pressing his attentions on the shy Micaela at the beginning of the opera. The chorus sang well and there was no fudging the French anywhere. The work was finely directed by Laura Alley with some very lively business on the streets of Seville in front of the tobacco factory, and later at Lilas Pastia's tavern. There was also a twist at the end which we decline to reveal but it worked well. Recitativi were sung, not spoken. The long scene in Act IV with the parade of picadors was cut but no one seemed to miss it. As usual, costuming (Charles R. Caine) was lavish, as one can see on the carousel of photos which we posted on our Facebook page (Voce di Meche). The tobacco factory girls were scantily clad (for that time period) and the gypsies and smugglers looked just the way one wants gypsies and smugglers to look. The military men looked exactly right. Also as usual, the set (Joshua Rose) was simple but effective, making use of projections. The lighting was fine, especially in Act III where the dark lighting elicited a sense of menace, leaving the audience to imagine the mountain pass. The overture began somewhat raggedly but Maestro Daniel Lipton brought the unruly strings under control rather rapidly and we particularly enjoyed solos by flute, clarinet, oboe and the brass section. Tonight we will be reviewing an evening of Puccini and hearing the large cast of women in Suor Angelica, most of whom are new to us. We are particularly looking forward to hearing Leah Marie de Gruyl as La Zia Principessa, having heard her in a master class. No one will leave depressed because that opera will be followed by another one-acter by Puccini that always leaves us laughing--Gianni Schicchi. Remember "O mio babbino caro"? This is the opera from which that aria comes. But you knew that already, didn't you? Do consider catching both the Puccini double feature tonight and Carmen tomorrow night!